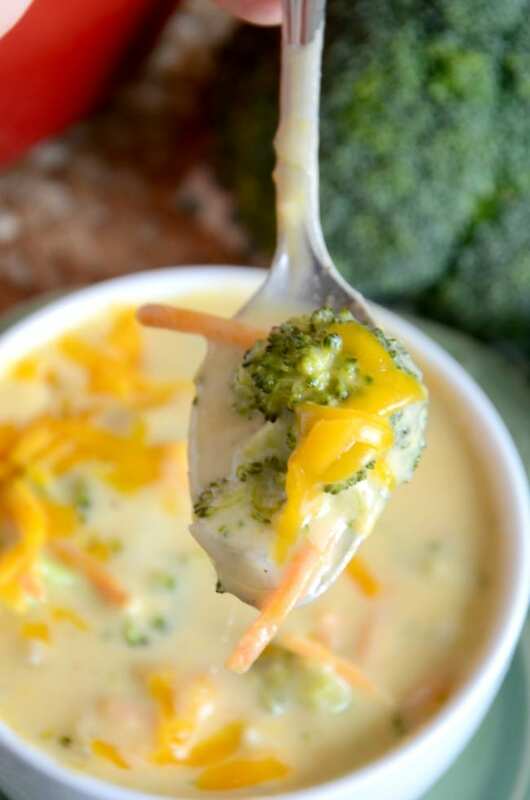 An easy gluten free broccoli cheese soup that will fill you up. One of the best parts about the cooler temps of winter is making homemade soup. 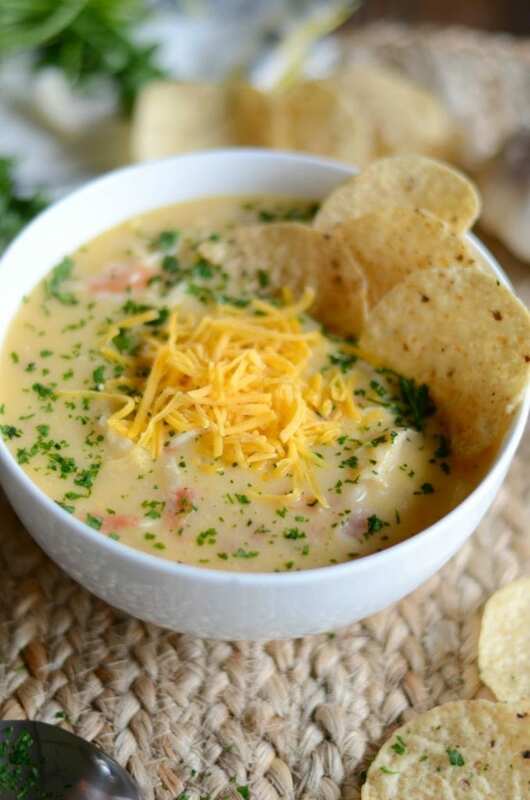 And as a mom who cooks gluten free, soup is especially easy to make as most soups are generally gluten free. 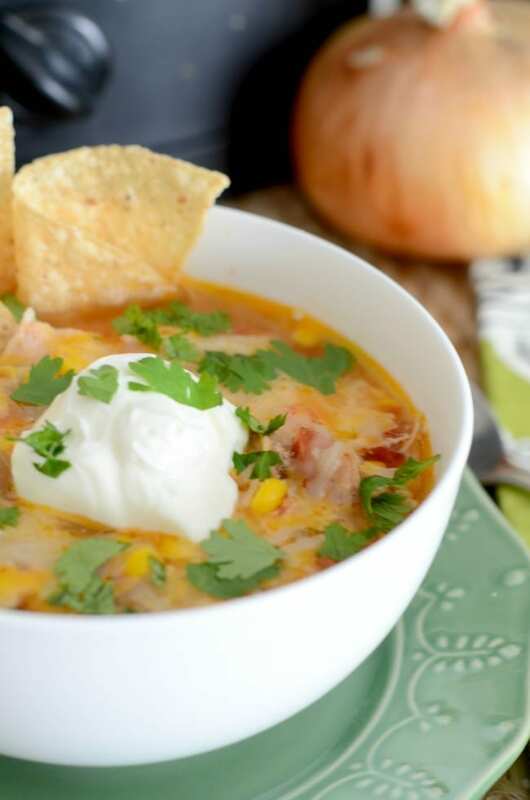 When the weather starts to cool off, adding soup to your menu plan once a week is a great way to make an easy and economical dinner. Serve with Honey Skillet Corn Bread and a side salad and your family will love soup night. The other great thing about soup is that it’s really easy to make a double batch of soup and freeze half. Just reheat and serve for dinner again a few weeks later. Cook once and eat twice is always a great way to make a mom’s life easier. What is gluten free broccoli cheese soup? 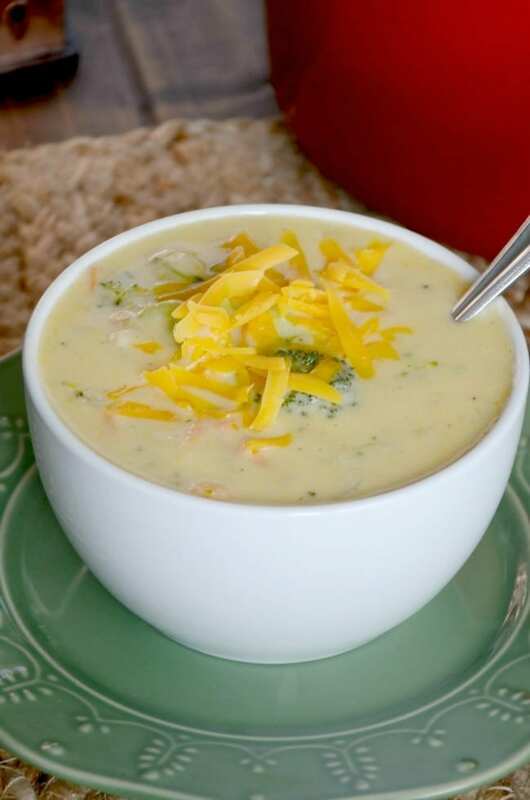 This broccoli cheese soup is a delicious combination of fresh vegetables, chicken broth and cheese. Some broccoli cheese soups are blended and smooth but this one is chunky and full of big pieces of broccoli! If you are looking for a soup that is full of chunky vegetable goodness then this the one for you! Oh yea – and it’s also gluten free! There is no wheat in this soup and that’s ok because it’s perfectly creamy without it. I know it’s hard to find gluten free versions of your favorite foods so I’m excited to share this easy dinner recipe with y’all! PS.. it’s also cooked all in one pot – or dutch oven! No extra dishes for this recipe. Just one large pot filled with the best broccoli cheese soup. For the vegetables, you need them to be fresh. I used four whole cups of broccoli in this recipe so you need a few crowns to get started. The carrots can be either sliced or shredded like the matchsticks you can find at the store. You can use whatever type of onion you prefer. I like sweet onions so that is what I used in this recipe. Now you do need to use a gluten free flour for this recipe. I like the Krusteaz all purpose gluten free flour blend because it’s easy to use and cooks up just like regular flour. If you have a gluten free flour that you like – great! Use that for this recipe. If you have any questions on flours, here is an article that shares 13 different gluten free ones. You can use whatever type of butter and chicken broth that you prefer. I would suggest unsalted if you are going to add salt to the soup, but if not, salted butter will be just fine. 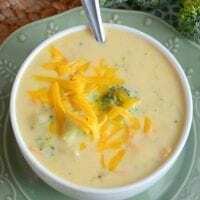 Any type of milk and cheese that you like will work fine in this gluten free broccoli soup recipe. I normally use whole milk and cheddar cheese for my soup. If you are dairy free, unsweetened almond milk is a great alternative. 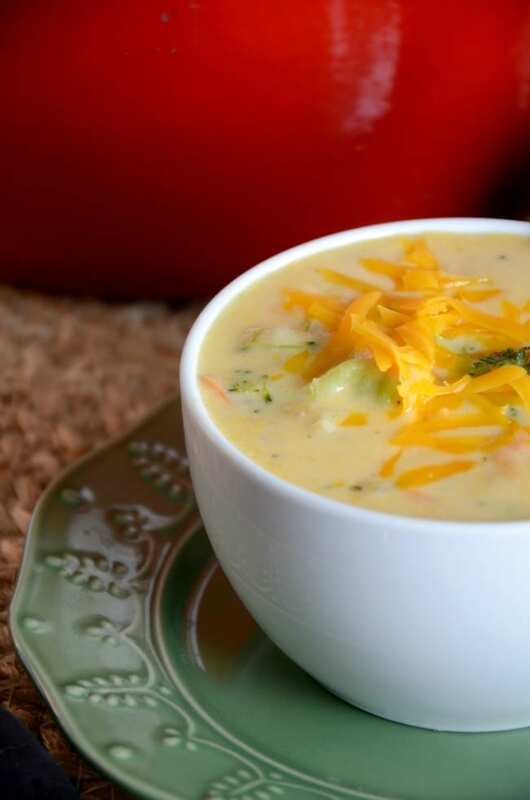 How do you make easy broccoli and cheese soup? There are a few simple steps that to making this easy broccoli and cheese soup. 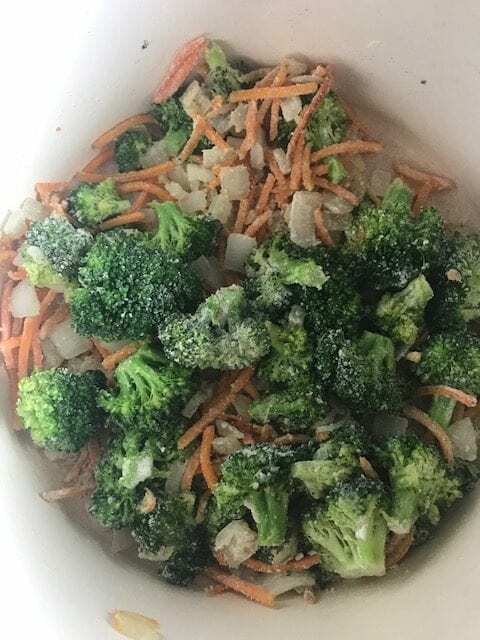 To start you need to saute all your vegetables (your broccoli, carrots and onions) in a butter. Let them cook until they are fork tender but still slightly crunchy. Then you start to make a roux. A roux is mixture of fat and flour that is the start of a sauce. In this case you add a bit of butter to your fork tender vegetables and allow it to melt. Then you add in your gluten free flour and combine it with the butter and vegetables in the pot. Allow it to cook for a minute or two. Slowly start to add in your chicken broth. Stir to combine it with your vegetable roux mixture. Once it starts to thicken, add some more broth until you have used it all. At this point you can add in your spices as well. Stir to combine them and bring to a slight boil. Add in your milk and continue to cook for about 10 minutes. You are just trying to heat the soup through since all the vegetables have already been cooked. Take it off the stove, stir in your cheese and allow to cool slightly. Spoon into bowls and enjoy! 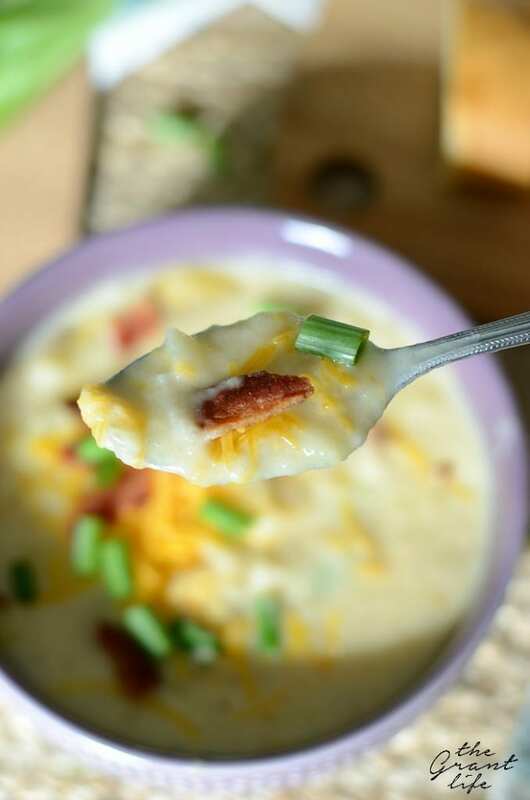 This soup is great during the colder months but we love it year round. Like I mentioned before as well, if you make a double batch you can either use the rest for leftover lunches or freeze it for later. It makes a great second day lunch! 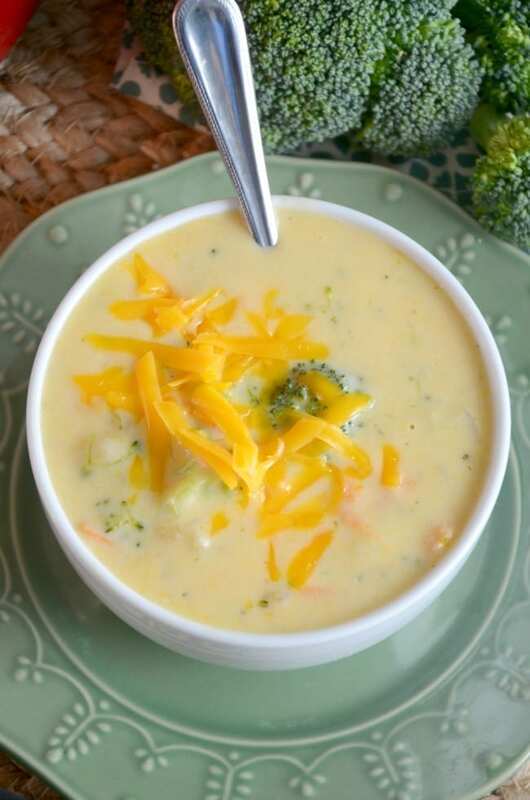 A chunky and creamy broccoli cheese soup that is also gluten free! 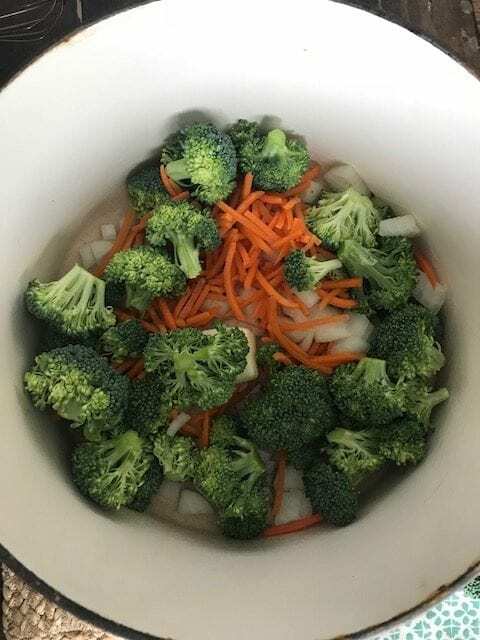 In a large stock pot over medium heat, add in 1 tablespoon of butter, the onions, carrots and broccoli. Saute until fork tender - about 10 minutes. Add in the other 2 tablespoons of butter and allow to melt. Sprinkle in the gluten free flour and coat the veggies well. Allow to cook for 2-3 minutes. Slowly pour in 1 cup of the chicken broth, making sure to stir in the flour well. Allow to thicken slightly. Pour in the milk and additional cup of chicken broth. Lower temperature, add in spices and bring to a low boil. Allow to boil for 5 or so minutes to heat the soup all the way through. Remove from heat, add in the cheese and stir to combine. Allow to cool slightly, spoon into bowls and enjoy! We made this fo dinner tonight. It was delicious! I went out and bought more brocolli so I can make it again tomorrow! Yessss!! Give me all the chunky broccoli cheese soup! So glad y’all enjoyed it!